Iran’s Relations with Russia: From Tactical to Strategic? Iran President Hassan Rouhani visits the Kremlin. CC 4.0 kremlin.ru. Tehran’s relations with Russia generally fluctuate between tactical and strategic. From an Iranian perspective, this is mostly due to two factors: who is in power in Iran and what is the state of the country’s ties to the West. Conservative governments tend to build a strategic partnership with Russia. For example, former President Mahmoud Ahmadinejad (2005–13) strived to do so as part of his ‘Look East’ foreign policy. 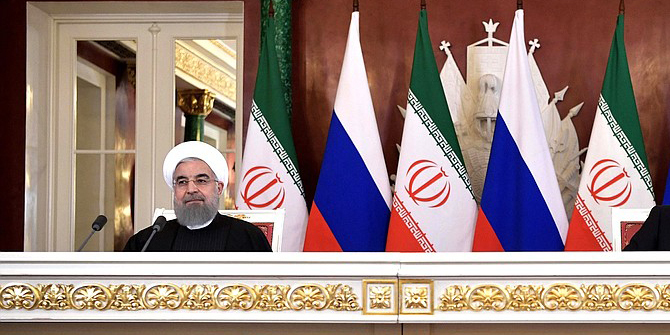 The fact that relations with the West are usually strained under such administrations facilitates the consolidation of Iran’s relationship with Russia, which shares, in particular, Iran’s anti-Americanism and its desire to sideline the US in the Middle East. By contrast, moderates and reformists largely prioritise the improvement of Iran’s ties to the West, giving rise to a perception of the Tehran–Moscow axis as tactical and issue-based. The fact that a moderate administration, led by President Hassan Rouhani, is currently in power, while at the same time the nature of Iran’s ties with the US is at a historic low, makes it particularly challenging for Tehran to shape its current relations with Russia. Since its election in June 2013 and, doubly so following the announcement of the nuclear deal in July 2015, the Rouhani administration has focused on reducing tensions with the West and increasing bilateral political and economic cooperation. This, in turn, has meant that Russia has been mainly perceived as an ally when interests align (such as in Syria), but with no ambition or desire to move towards a strategic partnership. Over the past year, things seem to have progressively changed. Ties to the West have worsened since the election of US President Donald Trump; amid the US’s aggressive posture towards Iran, Russo-Iranian cooperation has expanded. Resistance from moderate/reformist leaders to moving closer to Moscow, both on the regional front and on the nuclear deal, is now minimal. In fact, over the past few months Iranian officials acknowledged the support provided by Russia in the United Nations Security Council (UNSC) when it vetoed a resolution presented to pressure Iran over the illegal use of Iranian-made missiles by Houthi insurgents in Yemen; they similarly approved of Moscow’s criticism of the US for convening a UN emergency meeting to discuss demonstrations that left at least 21 people dead in Iran in January. As a consequence, more and more references to the strategic nature of Iran’s alliance with Russia have emerged. For instance, during his twenty-third visit to Moscow, Iranian Foreign Minister Mohammad Javad Zarif emphasised ‘the depth of the strategic relations between Iran and Russia, which still plays a key role in establishing security and stability in our region’. Similarly, Ali Akbar Velayati, a foreign affairs adviser to Supreme Leader Ali Khamenei, cited Russia’s opposition to the aforementioned UNSC resolution as ‘an indication of growing strategic relations between Iran and Russia’. Following Trump’s nomination of Mike Pompeo as Secretary of State and of John Bolton as National Security Adviser – both vocal Iran hawks – the head of Iranian parliament’s national security and foreign policy committee, Alaeddin Boroujerdi, stated that Iran’s leaders should: ‘strengthen our view towards the east, especially China and Russia’, echoing the policy previously advanced by Ahmadinejad. Tehran’s trajectory towards full alignment with Moscow, in spite of these statements, still faces significant obstacles. Chief among them is the inherent limit placed on cooperation by Moscow with Tehran’s adversaries, including Israel and Saudi Arabia. Despite Russia’s attempts to portray its parallel partnerships as a sign of its realpolitik-based approach to foreign policy, Iran feels that such relations exacerbate underlying tensions in the Russo-Iranian relationship and increase Tehran’s suspicions over Moscow’s long-term goals in the Middle East. This means that Iranian policymakers do not exclude the possibility of being abandoned in favour of another partner, should it become necessary or worthwhile, particularly in the case of Syria, where despite converging interests, the two lack a common strategic vision. Further mistrust emerged in Tehran over the past few months, with Russia seen as having capitalised on the situation in Syria without having paid the same price in blood and treasure as Iran. Whether Iran will decide to overlook these obstacles and opt for a full pivot towards a strategic partnership with Russia during the remaining three years of the Rouhani presidency largely depends on the policy the US will adopt in the region and, more specifically, towards Tehran moving forward. For instance, the US decision to militarily retaliate against the Assad regime is likely to strengthen the Tehran–Moscow axis in Syria and therefore reinforce their partnership. Similarly, the re-imposition of US sanctions and the consequent threat posed to the survival of the nuclear deal is likely to drive the Iranian government to re-consider its attempts to improve ties to the West and instead cause it to look East, towards both Russia and China. The months ahead may come to mark a defining moment in the formation of Tehran’s policy towards Russia for years to come. Aniseh Bassiri Tabrizi is Research Fellow at RUSI and Visiting Fellow in the Department of War Studies, King’s College London. Her research is concerned with security in the Middle East, with a particular focus on Iran’s foreign and domestic politics. She tweets @AnisehBassiri.